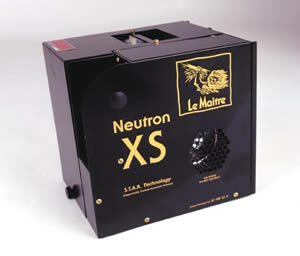 The Neutron XS Hazer utilises Le Maitres world patented STAR (Sequentially Tracked Automatic Re-Issue) technology to produce consistently pure haze with no oil, no water, no residue and no noise. This compact unit can deliver up to 150 hours of haze from just one 2.5 litre bottle of fluid. Combine this with its minimal power consumption and built in self cleaning mechanism, and you have a top of the range hazer that is low cost as well as low maintenance. Recently, Alton Towers installed 10 Neutron hazers in their latest Haunted House 'Duel' ride where riders shoot at ghosts and zombies with laser guns. Top class professional hazer from the leaders in special effects - Le Maitre.